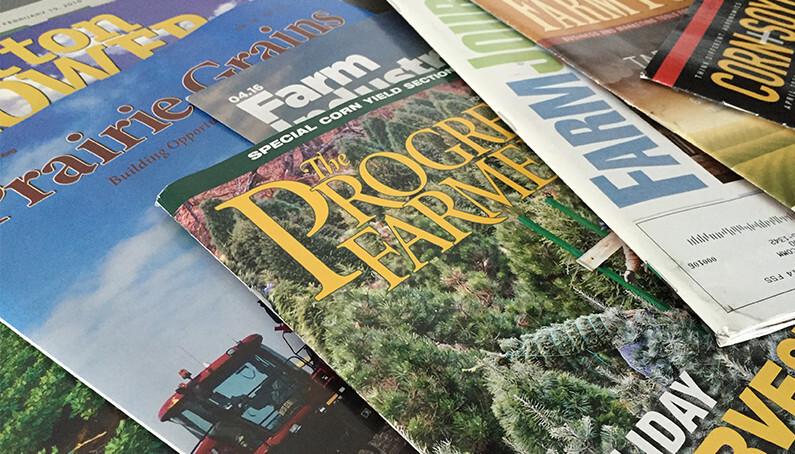 Unlike general audiences, farmers still turn to print as their #1 resource. Marketers targeting general consumer audiences wish they had it so good. In agriculture, you can achieve strong reach, deliver in-depth information and add instant credibility to your brand just by running a couple of print ads. Magazines are still published and, more importantly, still consumed, especially by farmers. Why? Sure digital/mobile receives all the love these days. But how does one discover the brand? What sparks the initial interest to begin an online search or reach out to a retailer with questions? Research shows the answer is Print. Multiple research studies from various industry experts continue to verify that, although it is not the only source, print is still the #1 source for farmers to learn about new products. Farmers also self-report print is the top touchpoint that prompts them to visit ag-related websites. No matter how you slice the data, print advertising is table stakes. If you want to be part of the consideration set, print is a critical channel to generate initial awareness. Here’s the thing they both have in common: half your audience in one fell swoop. No matter what your demo or geographic footprint is, you can achieve that same level of reach or higher with a couple of print ads for a fraction of the cost of the $5 million Super Bowl spot. Print is capable of efficiently reaching the majority of your target with essentially no waste. A few years ago, we executed a very successful print insert with an embedded video player and had growers across the country talking about a totally new, and somewhat complex solution. More recently we implemented a similar strategy and inserted a print ad with audio to meet a similar objective on another brand. This process of inserting video or audio was still in its infancy and, the audio insert had a shipping error. Improperly loaded shipping pallets inadvertently crushed the audio chips in the bottom layer of the ads. Farmers discovered the issue and called to alert the publication and the client about the damaged audio chip. Some farmers tinkered with it, deconstructing the ad to determine the root problem. One actually managed to reconstruct the crushed audio play mechanism. Others merely wanted to let the client know. No one was upset. That day validated what was long suspected, that: 1) farmers are fixers by nature; and 2) farmers pay attention to print ads. Print plays an important role in the grower journey. It serves as a springboard for ideas and initial information gathering. It is the gateway to the farmer. Print inspires curiosity and garners incredible reach, and farmers read it. Great comments and insights on the vital role print still plays for the farmer audience. I hope all media planners/buyers take note. It’s not all about digital. A combination of platforms that include print provides the reach and engagement marketers desire.